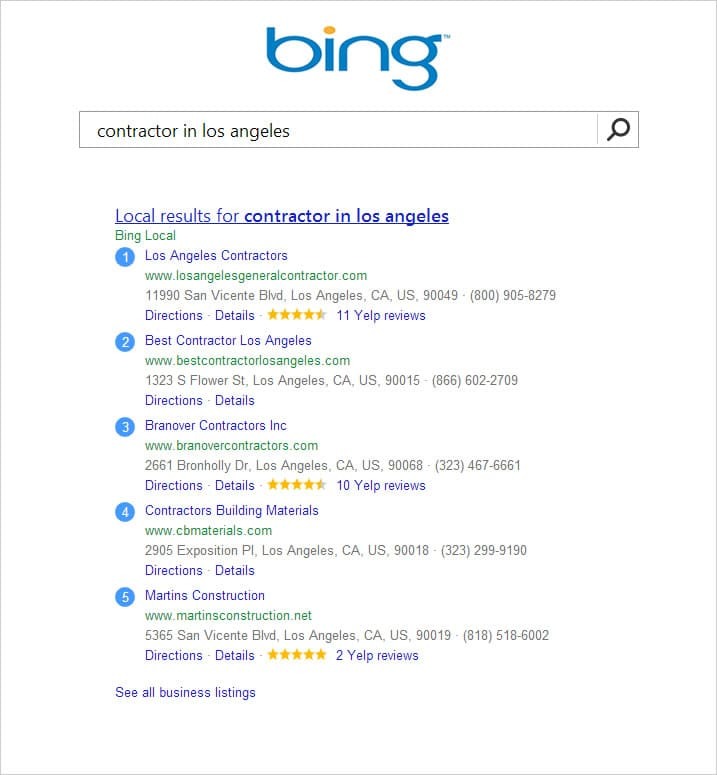 Did you know that over 85% of people looking for local contractors start by searching online? Of these people searching over 60% are targeted at local search results. Based on Google’s market share we estimate that over 2 billion local searches happen each month on Google alone. 50% of mobile searches have local intent. 82% of local searches result in an offline action. 5% of local searches include the city and/or state. When you start to factor in other local search sites like Yelp, Bing, YP, Apple etc… you can start to understand that local search is a huge opportunity for contractors to reach new customers. We see local search as a change in peoples behavior on how they search. People are becoming more and more geo-conscious and their searches are reflecting it. Basically, this means people are adding a location qualifier to their searches. For example, instead of simply searching for a “contractor” people are searching for a “contractor in Los Angeles”. One way we judge that local search is considered high value is simply based on the fact that Google gives it prime real estate on the search results. If Google didn’t see local search as high value and an important consumer need they would not display local search results on the top of the first page results. Google listens to their users better than most companies and people searching are telling Google “they want local“. 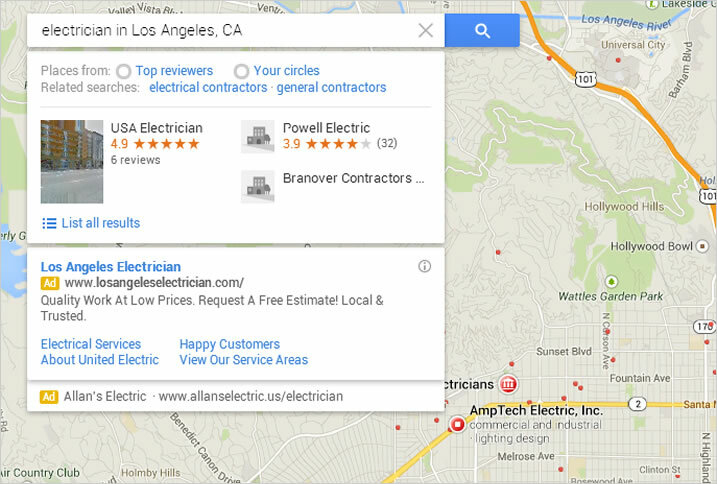 LOCAL SEARCH IS ABOUT POSITIONING YOUR CONSTRUCTION BUSINESS WHERE CUSTOMERS ARE ACTIVELY SEARCHING ONLINE! 72% of consumers trust online reviews and consider them just as valuable as a personal recommendation. When it comes to showing up on local search, the algorithm is quite complex and not all aspects of it are 100% clear. We do know that customer reviews are an important factor as of now and its equally important to collect them properly. Ratings and Reviews for your contractor business are important because they play a huge part in influencing potential customers to visit your website, call your company and in the end hopefully hire you. Local search looks at reviews as social evidence that a business is trustworthy and offers a valuable service. Reviews and ratings can influence your search ranking but to be clear this has nothing to do with your organic ranking and only applies to local search rankings. Today, we know that reviews and ratings impact map searches, the search carousel and mobile searches that have local intent. Map searches are when a user does their search on Google maps. 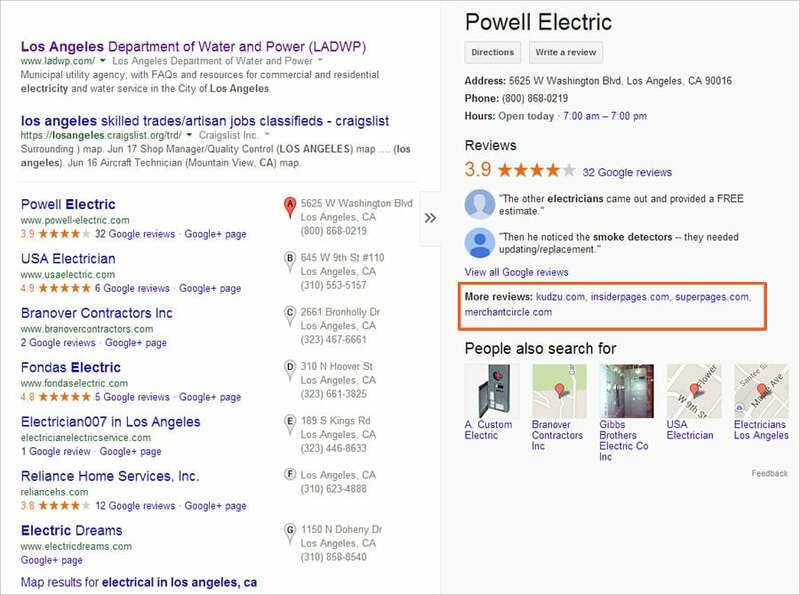 Google doesn’t display carousel results that often for contractors. But we wanted to include it since ratings and reviews impact this search result. 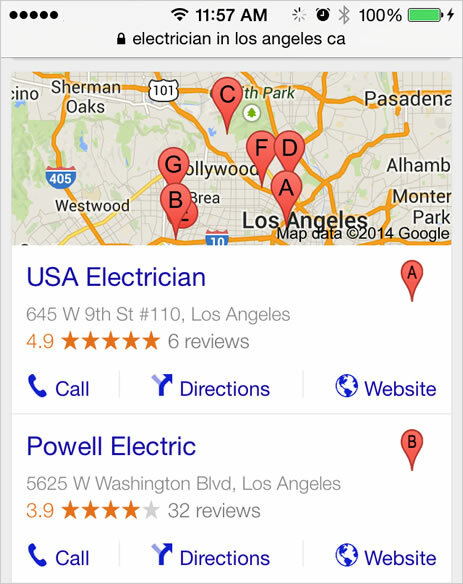 Searches with local intent on your mobile device are impacted by ratings and reviews. The most important thing about building reviews is DON’T RUSH. This is not about tricking local search and gaming the system, that approach will only end up in your demise. The last thing you want is for Google or Yelp or Bing or any other local search provider to summon their power and slap you with it. 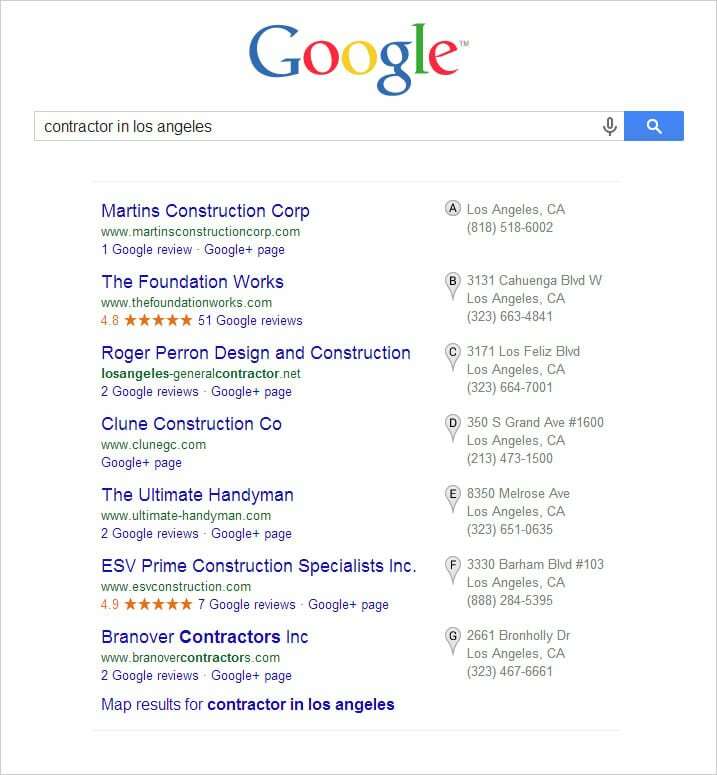 Search on Google for a keyword related to your construction service or trade with a city you want to target. 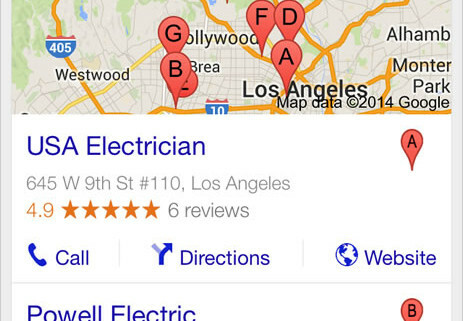 For example, “electrician in Los Angeles, ca”. On the business details on the right, look for the section that says “More reviews:” these are the sites Google is pulling reviews from for this business. It’s a good idea to get some reviews on the same sites to help you rank better. Don’t forget about the real reason people write positive reviews about a business. You may think this is a quick and easy way to review success and the truth is it will only hurt you in the end. There are no elevators to success so please remember to take the stairs. Paying for reviews includes incentives, so don’t offer a discount if customers write a review or give anything away for reviews. Yelp strongly enforces their terms of service that prohibits businesses from soliciting customers for reviews. The best way to get Yelp reviews is to make sure your customers know you are on Yelp. 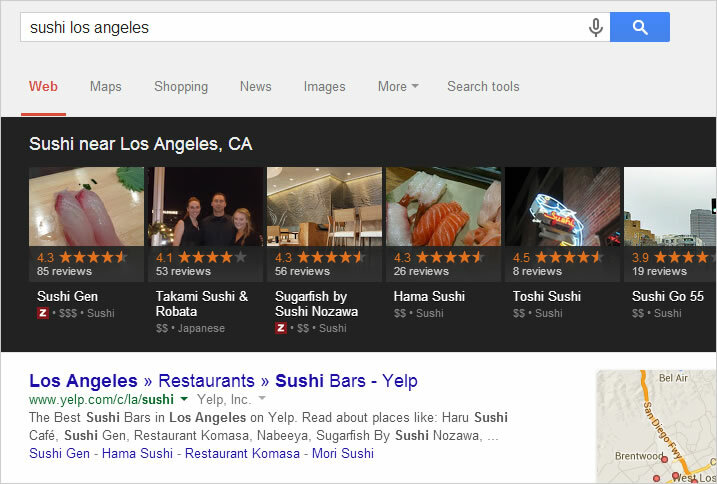 Put up a badge on your website that links to your Yelp page. Another good idea is to include your Yelp URL on your invoices and other office materials you handout to customers. You don’t always need the most reviews to rank on the top of local search. You need enough reviews to set your business apart in your trade. Our rule of thumb is if your competitors have an average of 3 reviews then 4 should be enough for you to start. You also don’t want all your reviews created in a short period of time, this is not how reviews are naturally created. Reviews are built up over time and you better believe local search providers factor this into their algorithm. Don’t strain yourself on getting reviews and ratings for your construction company. The real goal is to have customers that are satisfied with your services and the reviews will naturally come. 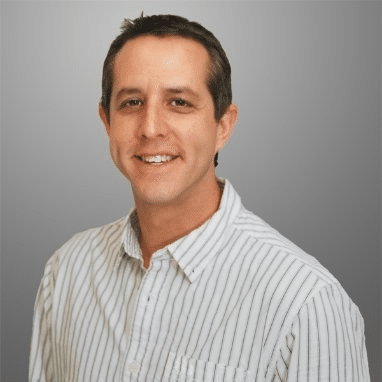 For this article we wanted to focus on making contractors more aware of local search, we aren’t going to go into all the details that revolve around local search optimization. We will publish some more articles soon that talk about different local search topics and optimization. Is Your Local Listing Data Permanent? Nope! If you have a specific question regarding local search please post it in the comments below and we will do our best to answer it. Check out the Local Search Marketing services we offer. Would like to express my appreciation in your effort it took to write this article. It was very well thought out and made a lot of sense to me. As a remodeling contractor outside the St. Louis area I knew this was very important stuff. Probably the last three months it has all started making sense to me. That is because of great articles like this. Keep up the great work! Thank you Bob we appreciate that very much. You are welcome Sheere. It looks like you have a pretty cool business in Santa Cruz, we would love to help you out with your website.